The latest election debate, (the second of three, which which was broadcast on Thursday, and hosted by Sky), focused on international affairs. However, if one found it a little tedious, the Labour Party have come up with a novel way to grab your attention. It was meant to be a rally for a seat in Northamptonshire. 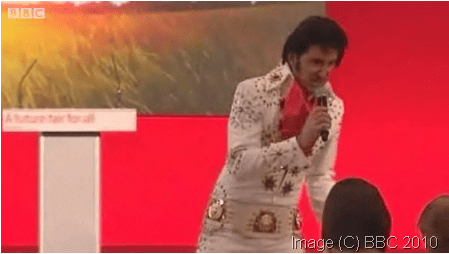 But following Mr Brown’s speech full of many-a-pun in front of mainly Labour supporters, he handed over to a man in a silly Elvis Presley costume, who started to sing some of the rock ’n’ roll star’s hits. You know when a man is losing hope at winning an election when he brings out an Elvis impersonator. What was even worse, and with a huge sense of irony, is that the song the man sang was ‘A Little Less Conversation’’. This was directly after a very long and boring speech with a few whiffs of banter (though as far as political banter goes, it was pretty dull), made by the Prime Minister. Watch the video on the Beeb.